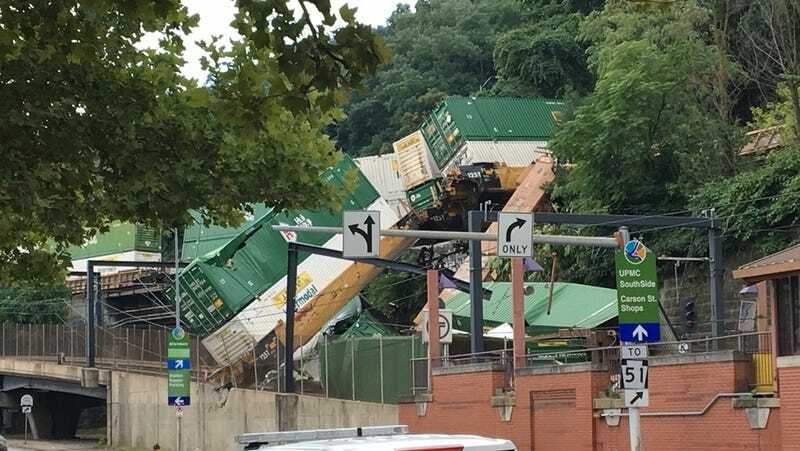 A Norfolk Southern train bound for Chicago partially derailed this afternoon, with four cars crashing onto the trolley tracks owned by the Port Authority of Allegheny County. None of the containers were carrying toxic materials, though one was full of Listerine. The Port Authority’s T and Bus service that use the Mount Washington tunnel or Station Square are suspended, and the Smithfield Street Bridge and West Carson Street are closed. No word yet from PA on detours or alternate arraingements for Monday service. This is going to take a while to clean up.